Movement, working out, exercise, call it what you want, it and I (is that how you say it-the English language) have a very special relationship. Movement is partly what saved me from a life strangling eating disorder. And when I’m not moving, long story short, it is often a slippery slope to the land of sorrows, depression and anxiety. And there is something so amazing about feeling strong, feeling alive, feeling in my body. I love exploring movements, I love being creative and pushing myself in a way that can best serve my body. But too much of anything can be a bad thing-even exercise. As I get older I’m more conscious of my joints, my bones, and trying to stay pain free, not just trim and fit. And about two years ago I took a very bad fall and it landed me a slow recovery and a body that felt like it was well into it’s 70’s or 80’s. Muscles wouldn’t let go of the trauma and I started to develop imbalances that were wrecking havoc on my body I fought so hard to keep living in. 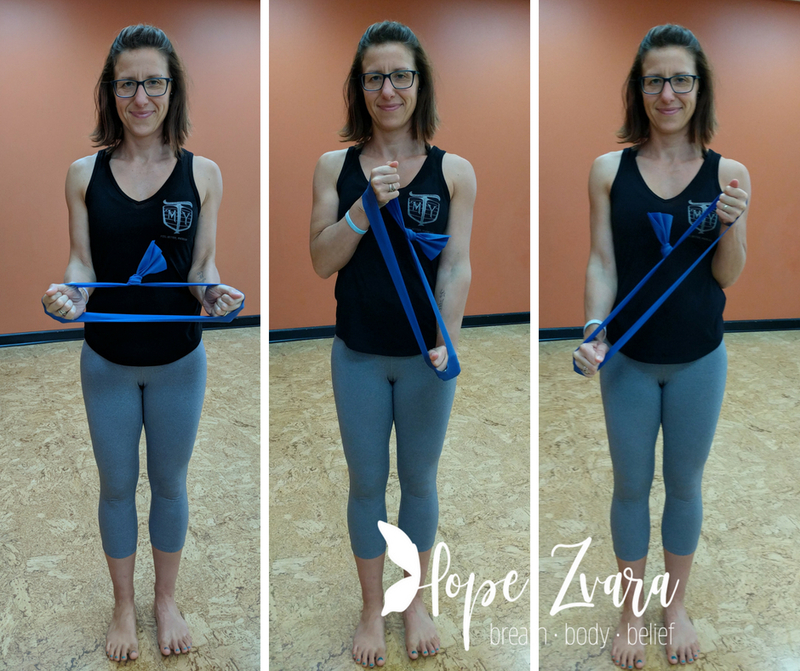 Rediscovering resistance bands was one thing that jump-started my bodies recovery and really began to heal my injuries and imbalances without pushing it too hard (and I had no intention of being as big as the Incredible Hulk). In my eyes resistance bands are a very unappreciated piece of exercise equipment. So many get sucked in to believing that the more expensive the better, and then never use it. But truth be told, bands are great, think of them as one step up from body weight exercises and super nurturing to your joints! 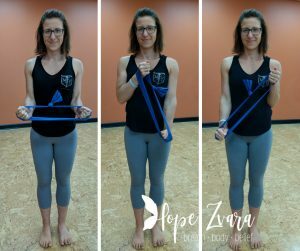 How do resistance bands work? Unlike weights, resistance bands don’t rely on gravity. The more you stretch the bands, the more they resist your movement, want to work harder, increase the stretch in the band. That means that if you work with a free weight you can only go as far as your joint will allow, but with a band, create more resistance and you have just increased your workout. And I love resistance bands because you can get creative, way more creative than you can with weights. 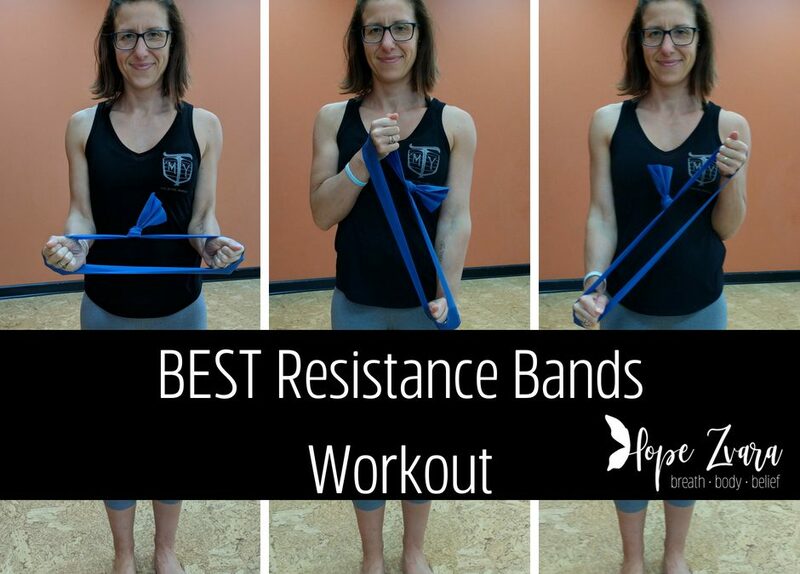 Here are some of my current favorites when it comes to working with resistance bands. Place a tied resistance band about the length of your forearm and place it over the balls of your feet. Stretch the band just enough so there is no slack. Keeping a tall body (no rib thrusting or booty pushing), start to march in place. Really work to lift your knee without leaning back or tipping forward. March in place 30 times. 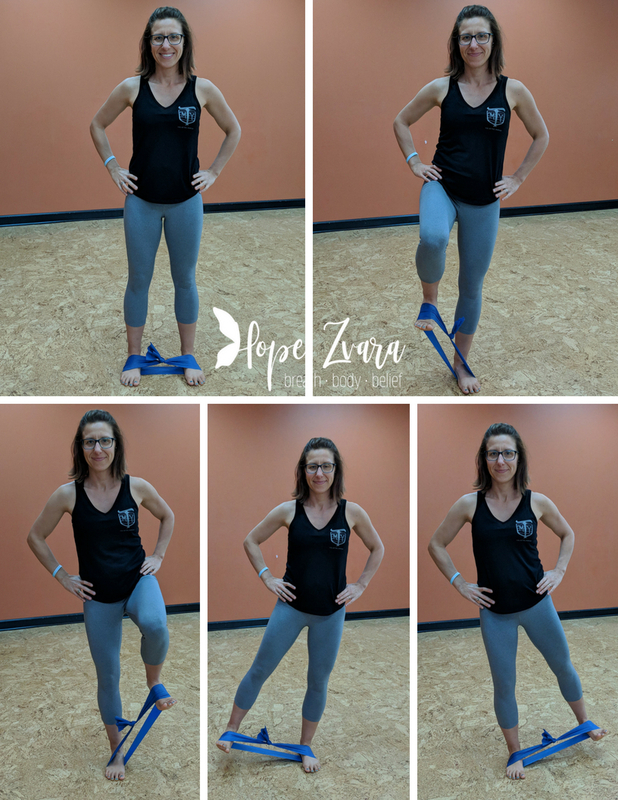 Next ground into one leg and keep a strong neutral rotation on the leg (pit of the back of the knee pointing back and on dumping into the hip), engage your glute and press out with the opposite leg for a lateral lift. 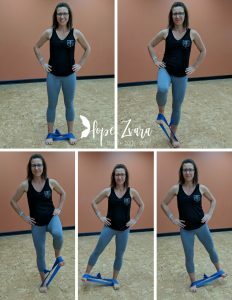 Think about kicking out with the heel not the toes (almost like internal rotation). Do this 10-20 times on each side. Standing strong in neutral, feet grounded and no rib thrusting. Place your fists inside the tied off resistance band. First anchor your elbows at your sides and press out with both fists (the movement comes from the elbow) on an exhalation. Try this for 10-20 times. Next keeping your upper body strong and stable pull one fist up and one fist down, like your arms are marching in place. Do this 10-20 times. Finally pull your fists diagonally and then back to center 10-20 times. Notice which arm is stronger and tune into making sure you don’t dominate the movements with that stronger arm. So many think their workout has to be at the gym in workout clothes and X minutes long to be “worth it”. But here’s the thing, I carry my bands with me in my car. Yes, I do a three minute workout here or there and it all add up! To step out of the box, you have to start to think out of the box! And you might as well add resistance bands in to that thinking too! Don’t have bands? I got you covered! Grab this kit and join me! Be notified when Hope posts a new blog!